People around the world have fallen in love with Penguin the Magpie, a global social media sensation, and her adventures with her human family. But there is far more to Penguin’s story than meets the eye. It all begins when Sam, Cameron Bloom’s wife, suffers a near fatal fall that leaves her paralyzed and deeply depressed. One of their three sons, reeling from the tragic accident, discovers an injured magpie chick abandoned after she had fallen from her nest. The boys name the bird Penguin, for her black-and-white plumage. As they nurse Penguin back to health, the incredible joy, playfulness, and strength she exudes fortify the family and especially lift Sam’s spirits. Penguin’s resilience demonstrates that, however bleak things may seem, compassion, friendship, and support can come from unexpected places ensuring there will always be better days ahead. This plucky little magpie reminds us all that, no matter how lost, fragile, or damaged we feel, accepting the love of others and loving them in return will help to make us whole. Cameron Bloom began his career as a surf photographer at the age of fifteen. Since then his editorial and travel images have been featured in many international publications. Cameron is also the award-winning cinematographer of Surrender, which was screened at the London Art Fair. Bradley Trevor Greive became a publishing sensation after the release of The Blue Day Book in 2000. He has since sold more than 25 million books in over a hundred countries. In 2014 he was awarded the Order of Australia for his service to literature and wildlife conservation. "PENGUIN THE MAGPIE is a triumph that will make your heart soar." "A unique and remarkable insight into a family dealing with tragedy and finding their way through it with love, courage, and hope." — Frans de Waal, author of Are We Smart Enough to Know How Smart Animals Are? "This beautiful, profound, life-changing book carries the message that wild birds have a depth of emotion, intelligence, individuality, and personality with which they can communicate empathetically and profoundly with people. 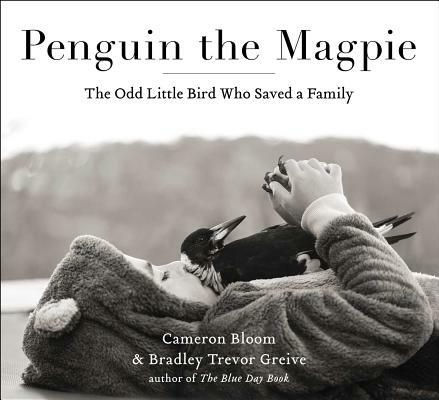 I find myself returning to this healing story again and again to marvel at and be inspired by the gorgeous souls of Penguin the Magpie and her human family." "A wonderful story of the interconnections that are possible between wild animals and people and the vital role that nature plays in human life and healing." "Written from the heart and exquisitely illustrated with striking photographs, Penguin the Magpie is an emotional journey from the depth of adversity to the height of accomplishment. Traversing this rugged ground reveals the world of a special bird and her connection to a family unwilling to fail. Laid bare are the mutual and life-changing bonds that form between birds and people." "A book that will make everyone’s heart soar." "In this sweet story of love and resilience, a wild bird becomes the one cure for a broken human heart." "Penguin the Magpie is a truly unique and deeply moving book and that shares an important message of love, resilience and hope. This beautifully crafted work combats the stigma that there is no life after sustaining a spinal cord injury and proves that we can find inspiration, empowerment and joy in the most unlikely places and when we least expect it. With stunning photographs, an extraordinary true story and a searingly honest portrayal of life after paralysis, this book addresses that while life may not be perfect, we can all find happiness, purpose and love even during the most challenging times. As Dana Reeve once said, “find the joy inside the hardship," the Bloom family takes readers on a journey of how they celebrated the small, yet important wins and ultimately reclaimed their future thanks to an unlikely feathered hero. On behalf of the Christopher & Dana Reeve Foundation we are proud to be associated with this wonderful book and we are grateful to the authors, Cameron Bloom and Bradley Trevor Greive, and the publisher, Atria Books, for donating a percentage of every book sold to support our work to find cures for spinal cord injury." "Be brave. Be open-minded. Be kind. Be forgiving. Be generous. Be optimistic. Be grateful for the many unexpected lessons you will learn. Find the joy inside the hardship. It’s there. I assure you. And, too, be open to inspiration from unlikely sources."